Location:Vivanta Pune, Hinjawadiis located at the heart of Punes IT centre and a few minutes away from the industrial hub. Situated 22 km from Pune Airport and 17 km from Pune railway station, this hotel is close to the offices of many top business organisations. Room Amenities: The hotel offers Deluxe Rooms and Executive Suites for the guest to choose from. All rooms and suites offer a view of the city and come with DTH TV, electronic safe, iron/ironing board, Wi-Fi, a walk-in glass shower cubicle and essential toiletries. The rooms boast of contemporary furnishing with lavish yet tasteful dcor. Hotel Facilities: The Taj Gateway combines corporate seriousness with indulgences like a spa that offers body therapies, scrubs, wraps, facials and a hair spa. The hotel has a business centre with facilities like high-speed Internet, translation/interpretation services, secretarial services and more. The hotel also offers a golf course and a fitness center that includes a 24-hour gymnasium and a swimming pool. 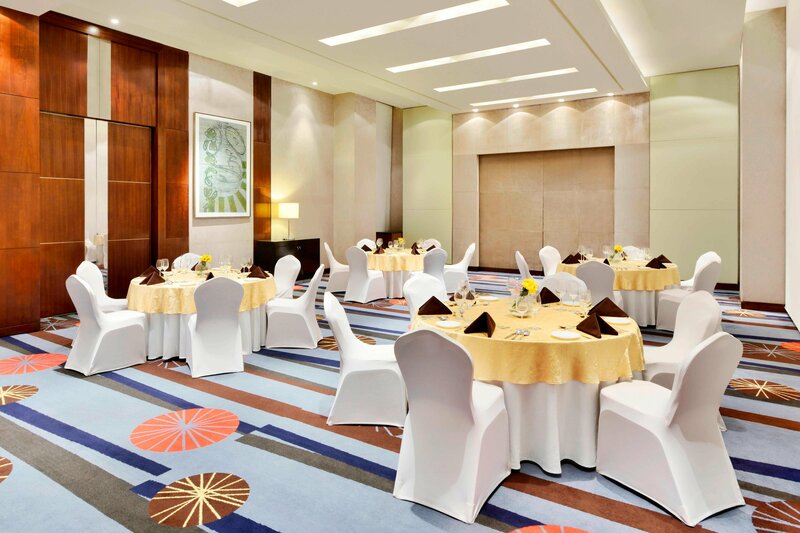 Two event rooms are also available with accommodation ranging from 25 to 300 people. Dining:Buzz is the 24-hour restaurant which offers a wide array of Indian and International cuisine, while Swirl, the in-house lounge, serves a wide variety of cocktails, premium spirits and finger food. Swirl is open from 3:00 PM to 11:00 PM. Note : SPA at the hotel will be Non - Operational due to up-gradation until further notice. Rate includes buffet breakfast at Buzz, 24 hours basic wifi on 4 devices, 30 percent discount across all hotel services. Taxes extra. Rate includes basic wifi up to 4 devices. Taxes extra. Rate includes buffet breakfast at Buzz - All Day Dining. Basic wifi up to 4 devices. Taxes Extra. Rate includes buffet breakfast at Buzz - All Day Dining, basic wifi up to 4 devices. Taxes extra. Experience in Taj Vivanta was great till I lived in this place. Quality and standard is not at all up-to the mark and brand. The quality to room, service and cleanliness is very poor. The manger is poorly groomed and no proper speaking and customer handling capability. He was very rude and not well mannered. Some of the staff were really good and helpful. Quality of house keeping was bad. Overall experience was bad. Nice stay, nice service, nice food and nice staff. Stayed at vivant, hinjewadi, Pune. Had excellent stay. We had come for a simple two night- Bandb get away. And I must say, we had a wonderful stay! The food is scrumptious, the service- prompt, the staff- courteous and friendly. Though the spa not being functional during our stay was a let down, we did have a great evening at their rooftop restaurant Vaandaag with some great food and a stand-up comedy presentation. Keep up with the great work! Excellent location and excellent staff. Nice relaxed leisurely stay staff is very polite comfortable stay. We stayed for one night at The Gateway. Our stay was enjoyable. Rooms were clean, staff was courteous and helpful. We did not like the buffet menu, which was a typical Maharashtriyan affair, could have been made better. We enjoyed the buffet breakfast. Must visit and stay at The property and value for money with great treatment and behaviour by The very beautiful staff. Taj is Taj. No comparison with any other 5 star property. More so The attitude of The staff with The customer is exceptionally well. Thanks. Very nice Hotel, courteous staff and superb service, very nice and tasty food, nice location, nearby to xi on mall, only there should be a bigger pay area for kids. But overall value for money hotel. Went for a break from door bells, phone bells, television and The grind. Became a great holiday with awesome family time spent in pool, relaxation at The spa, and had a different cuisine everyday. We enjoyed our stay very much The staff is very good throughout The Hotel especially at The buzz Mr SURJIT, Ms ruby, Mr KAVIRAJ and The housekeeping staff Mr SHREYANSH and Mr LAKSHAMAN were very cooperative and well mannered. Overall The best place to stay in HINJEWADI Pune, in real terms it is a five star. Was planning a quick break with my family of 2 adults and 2 kids 6 and 3 years when stumbled upon the taj gateway at Hinjawadi, Pune. To be very honest I was surprised to see a taj property at such affordable rates with an awesome buffet breakfast and worth of Vivanta Pune, Hinjawadi credits. From the moment we reached the place there were quite a few things that i really liked. To begin with, the team at the reception was warm and guided us well. We requested staff at the reception if he could help us with an extra mattress. Though he did mention that an extra mattress would be charged, he gave it to us without any additional charges. The rooms are nice, well lit, clean and with adequate amount of water bottles. The recreational area has table tennis, a tiny kids zone and swimming pool which is a tab bit small. The water in the pool is chilly whatever time of the day you plan to go. It's partly because it's has a covered roof and no kind of heating mechanism to keep the temperature warmer. However they do have an awesome steam room. Staff who means the pool area was a very kind and helpful person. He would make sure that we got the best service while we were in the pool and recreation area. The buffet dinner and breakfast was simply awesome. Had read rave reviews about it online and also experienced it in the person. Staff made sure we were well looked after at the dinner and breakfast tables. All in all the stay and the food was awesome. I highly advise anyone who wishes to have a quick getaway with the family for a few days. Stay of 3 days and with family. Enjoyed the hospitality. Very friendly and helpful staff. Always greeting us as we moved around the premises. The restaurants are good. A little put off by the chipped cup in which I was served coffee when I took my first breakfast. The travel desk even arranged cars for sightseeing and for trip to Lonavala. The local sightseeing driver though friendly made us walk a great deal because he kept his car parked in one place and said, we had to check-out the place on foot which was exhausted. Housekeeping was great. Very prompt and friend staff. No snooty behaviour. Made us comfortable. Loved our stay here. Excellent staff. Very helpful. Smiling. When I was served coffee in a chipped cup at breakfast in Buzz. Housekeeping is excellent. The Driver for local sightseeing made us walk around a lot. He insisted we check that he would Park the car in Shanivar vada and left us to trudge around which was exhausting. The reception always greeted us on our way out or in. I loved the stay and would highly recommend the Vivanta Pune, Hinjawadi. Spa was not operational. Salon was closed. Had gone there for relaxing but the entire weekend went in just complaining. The operation manager was good. He patiently listened to our problems Location is OK but the property is very good. Rooms are amazing they have all the facilities. Breakfast was very good. And the best part was the staff and service. Very humble and polite staff. Roof top pool is very good. We got a very good deal on MMT and Taj gateway also upgraded our rooms. I recommend everyone to check on MMT once for room booking they have some really good deals. We were friends and the service provided by the Taj was awesome. I really enjoyed the stay at Gateway, Hinjewadi. Gateway has maintained an excellent standard in each and every aspect of hospitality(i.e. cleanliness, service, food quality etc.). I wholeheartedly appreciate the staff at Buzz for their help and the service provided during my stay. They were extremely professional and also helped by recommending local/exquisite cuisine as part of their dinner buffet. Altogether, an excellent place to stay in Pune and would certainly recommend to my friends and colleagues as well as like to return to Gateway for future visits. The breakfast options are not that much but the quality of food was good. Location is good as Dmart Supermarket is beside the property. The staff service was good. The property doesn't have any board games. The spa and steam room were good. The room which we stayed in was twin bed with extra bed, but as soon as the extra bed was put the room become quite small. I would request them not provide twin bed room with extra bed. Rest we had an amazing stay. The property was pretty good. I stayed with my wife and 2 months baby at The Taj Gateway Hotel, Pune. The staff was awesome, food was great, facilities were good, but only one problem. The Vivanta Pune, Hinjawadi has a severe pest issue and must get some pest control done. There were mosquitoes in my room and flies in the Coffee Shop and reception area. If you leave this issue aside, our stay was very good. The staff is extremely courteous and the food is very good. Our stay at Gateway by the Taj at hinjewadi Pune was a memorable and comfortable one. We had booked a suite room from MMT and had got a Taj experience voucher of Rs 1000 complimentary which we used for their spa. Breakfast was above average and shall be good if they can increase their spread. The rooftop pool is pleasant. Their rooftop bar had a nice ambience at night with some lovely live music playing. The suit room is very well made. Opted for a weekend stay Taj Gateway was overall a fine property with an Covered indoor pool being 4ft was fun for kids though the water was very cold. Nicely done up saloon and spa but not much staff to pamper you there. A decent gym and a table tennis nothing much for kids to enjoy. The food and service was impressive. Rooms are very basic / simple but facilitated. Went there on our anniversary and the manager arranged a cake and decorated the room. The room was good but the service was just amazing. Everything from check-in and check out was super smooth. Staff was very courteous. Make you feel like home. We also got 30% discount on all the services and a voucher from MakeMyTrip. What else you can ask for. Go try. It was quite a pleasant stay. Stayed there for 2 nights. Especially the service was really impressive. Right from the front desk to restaurant to room service. However, in terms of room interiors and the feel of the place, it should be rather be classified into 3 star Vivanta Pune, Hinjawadi. Overall was quite satisfied with my stay. It is well located Vivanta Pune, Hinjawadi in the city. The Vivanta Pune, Hinjawadi team is cool and cooperative. The food is tasty and chef is also good. Everyone tried to make me comfortable. The housekeeping was good. Prashant from housekeeping team was very dedicated. The reception response was also very cooperative. We had asked Vivanta Pune, Hinjawadi staff to decorate our room for birthday celebration. I must say, they had decorated the room such a nicely that I was so happy. Special thanks to Trina and Team. Hotel staff is so polite and helpful. Food quality is also standard. They have made my day. Thanks Gateway Hotel, Pune. Overall great experience and hospitality. Excellent experience overall. Food is awesome. Rates are reasonable for a five star. It was a good stay, recommended for a short weekend. Location food and service was good. The room was good, the pool was very small much lower than expected. Good service and room was also upgraded. Breakfast was also good. So overall stay was 5 star. Awesome place for weekend holiday. Everything was just perfect in Taj. Centrally located. Good food and service. Staff was polite did not find any issues. Booked through MakeMyTrip, it was amazing. The staff were very good. Room was beautiful, clean and well maintained. The service were of top class. Food was awesome. Everything about the stay was just awesome. Everything about the stay was very good. The room, cleanliness, service and the staff were awesome. I enjoyed my stay. Taj franchise is always awesome I took membership after staying in taj. Wherever I travel I prefer taj over any other Vivanta Pune, Hinjawadi. It's hospitality is awesome . I go regular on business Tours and everywhere I prefer taj or it's franchise. Happy with the overall service. One amongst the best places to stay on shorter trips to the city. Warm service with gourmet food and clean, well maintained rooms. Location was good, food was fantastic. Very nice and maintain everything. Was there for one day and it was an peaceful stay. Good staff quick service and good food.